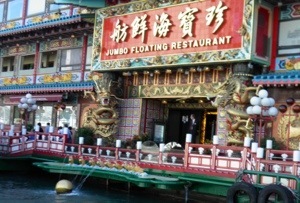 The ornate red and gold exterior of the giant floating restaurant and Theme- Park-in- Water, the humongous Jumbo Kingdom, is in sharp contrast to the traditional junks and sampans crowding Aberdeen harbor, Hong Kong. The pier arch sets the mood of a Chinese film set (Jackie Chan movies –Enter the Dragon) as free boat shuttle ferries you to the entrance of one of the world’s largest floating restaurant and a tourist icon of Hong Kong. If the exterior is gaudy the interior resembles a Chinese film set (Jackie Chan’s Enter the Dragon) flaunting a setting for ‘princely’ shenanigans. 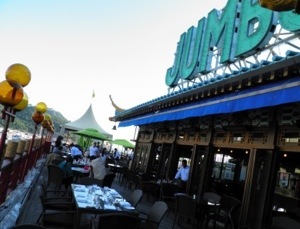 The Jumbo Kingdom, inclusive of the Tai Pak Floating Restaurant is an assemblage of flamboyant and somewhat pretentious decor, fine dining, banquet and wedding facilities, sightseeing and cultural attractions that dazzle your senses. 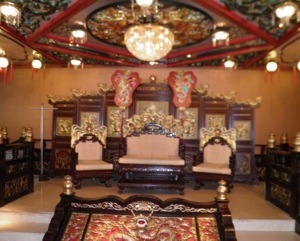 The best way to avoid the blitzkrieg of colors is to find a comfortable corner in the sprawling 9000 sq.ft. Top Deck al fresco dining area and splurge on exotic cocktails and international cuisine. Avoid looking at the price list, it is expensive, and instead relax and hopefully catch a wedding photo shoot with the majestic yachts as background. We dined there oh so long ago and remember only the flamboyant interior 🙂 Lovely photos. Wonderful, I dined here a couple of times in the late 70’s. Hasn’t changed at all. Thanks for bringing back great memories. Great photos! Beautiful photo’s … I really like how ornate it is. I would be distracted from eatin because I would want to get close to all of the things I would want to view. The colors are bright and the details are incredible. Very informative post….!!! !